Heat 1 tbsp olive oil in a frying pan on a low heat and use to fry 2 onions, roughly chopped, for 8 minutes until soft. Add 1 tsp cumin seeds, 1 tsp ground allspice, ½ tsp chilli flakes, then add 1 garlic clove and 1 red chilli, both chopped. Stir over a medium heat for 1 minute, then add 2 x 400g cans essential Waitrose mixed beans, drained and rinsed, 400g can plum tomatoes and 150ml water.Season and simmer for 10–15 minutes. Meanwhile, crush the flesh of 1 avocado. Chop 2 tbsp coriander and stir into the avocado with 1 garlic clove, crushed, and the juice of ½ lime. Heat 4 flour tortillas according to packet instructions. 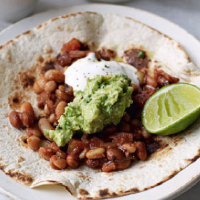 Divide the beans between the tortillas, top with guacamole and a little essential Waitrose half-fat soured cream. Serve with lime wedges.